Recent visible wavelength observations of Multiwalled Carbon Nanotubes (MWCNT) coatings have revealed that they represent the blackest materials known in nature with a Total Hemispherical Reﬂectance (THR) of less than 0.25%. This makes them exceptionally good as absorbers, with the potential to provide order-of- magnitude improvement in stray-light suppression over current black surface treatments when used in an optical system. Here we extend the characterization of this class of materials into the infrared spectral region to further evaluate their potential for use on instrument baﬄes for stray-light suppression and to manage spacecraft thermal properties through radiant heat transfer process. 300 K. These results will be compared with other more conventional black coatings such as Acktar Fractal Black or Z306 coatings among others. Keywords: Multi-Walled Carbon Nanotubes (MWCNT), Hemispherical Reﬂectance, Emittance, Stray-light. 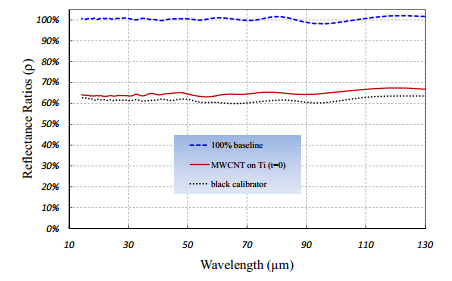 In this paper, we investigate the infrared properties of Multiwalled Carbon Nanotube (MWCNT) coatings. This is a follow up study to our earlier eﬀort primarily aimed at developing these nanostructure materials for stray light and diﬀraction suppression at visible wavelengths. 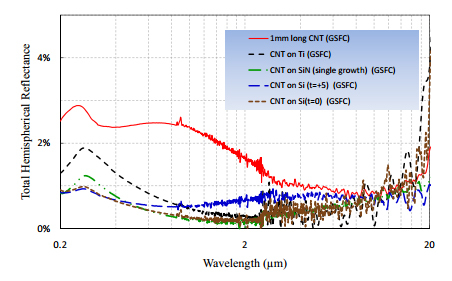 1 Our group has found that MWCNT are exceptionally good absorbers, with potential to provide order-of-magnitude improvements over current surface treatments and a resulting factor of 10,000 reduction in stray light when applied to an entire optical train. Our research has been motivated by the stringent stray light control needs which occur in the realization of precision optical systems for remote sensing. Examples include earth observations by satellite imaging systems where high brightness contrast exists between desired ﬁeld of view and other background sources which can illuminate and scatter from elements of the instrument. This bright light diﬀracts from instrument structures, rattles around and invariably contaminates measurements. Astrophysical observations are also impacted by stray light that obscures very dim objects and degrades signal to noise in spectroscopic measurements. Stray light is controlled by utilizing low reﬂectance structural surface treatments and by using baﬄes and stops to limit this background noise. Development of this technology will provide numerous beneﬁts including the increase in observational ﬁdelity by reducing scattered light in high contrast regions. Our ob jective has been to develop and apply MWCNT to instrument components to realize the beneﬁts mentioned above. We have addressed the technical challenges to advance the technology by tuning the MWCNT growth geometry using a variety of methods and on various types of substrates to provide a factor of 10 improve- ment in absorption at UV/visible wavelengths over current surface treatments used in space ﬂight hardware. of temperature. We have used this type of characterization to optimize the growth process and geometry for robustness and maximum absorption. In addition to the applications mentioned above, optimization of the MWCNT samples will be pursued in detector applications to enhance light absorption in order to realize gains in detector quantum eﬃciency. The paper is organized as follows: we will ﬁrst present a discussion of the reﬂectance properties and a description of the method used to derive the temperature-dependent emittance property using an optical method. This will be followed by a description of the equipment used to measure the Total Hemispherical Reﬂectance (THR) quantity in all of our samples. We will then proceed to show the results of THR and emittance calculations for samples grown on various substrate. This will be followed with concluding remarks. The term bi-directional reﬂectance ρ (θi , φi ; θs , φs ), is deﬁned as the amount of light from a given direction θi , φi that is reﬂected into a speciﬁed solid angle dΩs and out going direction θs , φs as shown in the diagram of Fig. 1. Finally, it should also be noted that for diﬀuse and isotropic reﬂectors εt (θ) = constant and, in this limit, the integral in Eq. 8 yields εH = εt . This is what would be expected for a Lambertian surface. For specular reﬂectance, the angle of reﬂection is equal to the angle of incidence on the substrate; direct reﬂection oﬀ the surface is carefully controlled. In most optical instruments the source of stray light that is more diﬃcult to control is the diﬀusely scattered light at all angles. This light can be reﬂected many times and ﬁnd its way to the instrument focal plane where it can degrade the observations by creating noise that obscures the signal of interest. 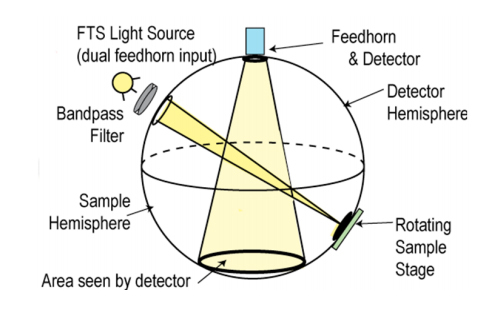 Characterization of this scattered light leads us to the concept of Total Hemispherical Reﬂectance (THR) which is the reﬂectance measured of all light that is scattered oﬀ of a test sample at all angles. The measurement of THR does not discriminate the angle of reﬂectance; only the total amount of reﬂected light. It is also a good measure of the relative ability of materials to absorb light and therefore it could be an eﬀective screening tool to determine the eﬀectiveness of a particular MWCNT growth process. However, it does not provide the full range of characterization required for modeling an instrument to determine system stray light. Our chosen method for measuring THR is with an integrating sphere where an incoming beam illuminates a test sample attached onto the sphere from a given direction and the radiation scattered by the sample is collected and detected. The results reported here on the MWCNT samples were obtained over a spectral range from 0.2 to 110 μm. Collection of data over such a wide range required the use of up to 3 instruments. The UV/Vis/NIR spectral range from 0.2 to 2.5 μm was measured using a Perkin Elmer Lambda 950 equipped with a 60 mm diameter integrating sphere. Figure 2. Diagram of the ambient temperature Bruker FTS integrating sphere reﬂectometer. the wavelength range between 0.200 and 0.860 μm. Finally the inside of the sphere is coated with a Spectralon coating. For coverage at longer wavelengths, we used a Bruker Fourier Transform Infrared (FTS) spectrometer with an integrating sphere accessory that is ﬁtted with a room-temperature DTGS detector to provide coverage in the 2 to 20 μm wavelength range. A second integrating sphere was used to obtain THR data from 20 to 110 μm. This accessory is equipped with a 4.2 K detector bolometer and it is capable of providing THR data at cryogenic temperatures (5 to 100 K). Operational features and construction details for these two integrating sphere accessories will be provide in the following sections. The Bruker FTS (IFS125HR) was the instrument of choice to collect data in the 2 to 20 μm spectral range at ambient temperature (300 K). Adequate experimental conditions for measurements in this spectral range were achieved by choosing combinations of the following components: tungsten lamp or Globar source, Si/CaF2 or Ge/KBr beam splitter and a DTGS detector with a KBr window. 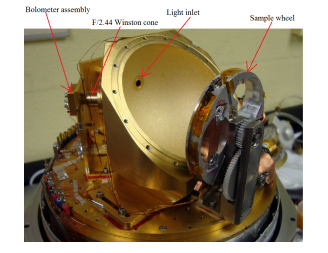 The reﬂectance attachment used for these measurements was mounted in the sample compartment of the spectrometer and it consists of a hollow sphere (75 mm diameter) coated with an electro-deposited Lambertian gold coating on the inside. As the Fig. 2 shows, the sphere has one beam inlet port, two sample ports and one outlet port allowing the light to reach the detector after the integration. The infrared (IR) beam enters the integrating sphere through the beam inlet port and impinges on the beam-steering mirror which is mounted inside the sphere slightly oﬀ center. Depending on the position of the beam-steering mirror, the IR-beam is directed either to the upper or lower sample port. In either case, the angle of incidence for the IR-beam impinging on the sample (or reference) is 13◦. In this conﬁguration, the specular and the diﬀusely reﬂected radiation hits the sphere wall at least once and, therefore, both are included in the ﬂux measurements. In this arrangement no baﬄes are needed. For measurements in the far-infrared spectral region (20 to 110 μm) we used a reﬂectometer ﬁtted to a second Bruker FTS spectrometer (IFS113). 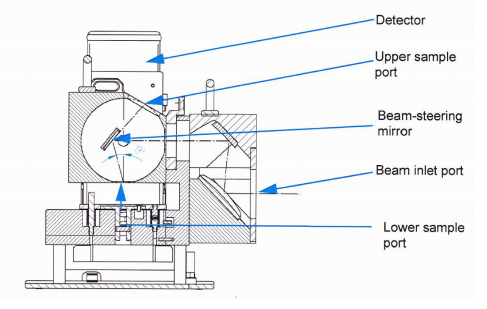 Figure 3 shows a diagram of this reﬂectometer that is uniquely suited for performing hemispherical reﬂectance measurements at cryogenic temperatures (5 to 100 K). approximately isotropic scattering surface, and gold-plated to maximize surface reﬂectivity (see Fig. 4). Light enters the sphere through a double-ended f/6 Winston cone; this provides illumination to a small patch (21.8 mm diameter) on the target. The input light is either a mercury arc or a glow-bar that comes from inside the Bruker FTS. Three targets sit within a three-position sample wheel, allowing us to measure in sequence a black (absorptive) target, a reﬂective target, and the test sample. The wheel also has a magnetic switch that allows accurate tracking of the rotation position. Light reﬂected oﬀ this test sample then scatters inside the sphere to an f/2.44 Winston cone that brings the light to an Infrared Laboratory Inc. (IR-Lab) cooled Si bolometer. This cone is positioned so that light from the sample cannot directly reﬂect from the sample into the detector Winston cone; this eliminates the need for baﬄing inside the sphere. The sphere and bolometer are mounted to the cold plate of a liquid Helium cryostat. The sample wheel is thermally isolated from the cold plate with a stainless steel support bracket, and has a mechanical heat switch to provide the ability to thermalize the wheel. Mounted to the wheel are both a thermometer and a 300 Ω resistive heater; the heater allows the wheel, when isolated, to be temperature controlled between ~4.2 K and ~100 K. Thermal radiation from the wheel provides the limit at the upper end of this scale, as when the wheel temperature exceeds 100 K, it radiatively heats the bolometer. The growth of high-absorption low hemispherical reﬂectance MWCNT samples has been achieved through three phases. The ﬁrst phase consisted of tuning the nanotube geometry to produce the desired low reﬂectance over all angles on Si. Next, we worked on improving adherence of the MWCNT layers onto Si. Finally, we have worked on nanotube deposition on alternate substrate materials in order to broaden the scope of application, such as improved components for stray light suppression and for use as infrared detector absorbers. Fabrication of vertically oriented MWCNT ﬁlms was accomplished by catalyst-assisted chemical vapor deposition (CVD). Using Si as the growth substrate, the fabrication begins with the thermal deposition of aluminum/iron thin ﬁlm catalyst. To grow MWCNT, the substrate is exposed to ethylene feedstock gas at 750◦C in a reducing environment; the ethylene is dissociated at the iron surface, and the carbon is extruded in the form of a dense ﬁlm of aligned MWCNT. Precise patterning of the MWCNT ﬁlm can be accomplished by constraining the placement of the catalyst ﬁlm through conventional lithographic means. Figure 4. Picture of the lower half of the OPASI-T cryo-reﬂectometer integrating sphere. The upper hemisphere is removed for viewing clarity. tall MWCNT. We studied the extreme regime of catalyst thickness to characterize the limits of this technique to producing low MWCNT ﬁll factors. Minimization of catalyst ﬁlm thickness resulted in an order of magnitude improvement in the performance of the MWCNT as an absorber. Our process resulted in MWCNT with inner diameters of 1-5 nm, outer diameters of 30-100 nm and average spacing of 100-500 nm. The best samples had lengths of 50 to 100 μm, but it is highly probable that longer lengths would provide better performance. 4 We have also recognized the importance of carbon nanotube adhesion given the environmental conditions associated with end usage. Other properties we have considered are how straight the ﬁbers lie, their heat capacity, charging properties in a radiation environment, and others. The adhesion question is discussed in more detail in the following section. Carbon nanotubes grown on Si with only the iron catalyst layer exhibit poor adhesion; it is quite easy to rub the nanotubes oﬀ of the substrate with any contact. This poor adhesion severely limits the utilization of MWCNT in space ﬂight hardware. Previous work suggests that the point of failure is at the catalyst-substrate interface. We explored alternative substrate preparation techniques to improve adhesion. The primary approach we developed was to use a thin-ﬁlm adhesion layer under the iron catalyst layer. We experimented with chromium, titanium and alumina underlayers. The approach was straightforward and should not have signiﬁcantly impacted the favorable properties of the thin Fe catalyst ﬁlm. What we found however was that the nanotube growth properties were signiﬁcantly aﬀected by this layer. It was determined that alumina provided a good adhesion layer without degrading the optical properties of the carbon nanotubes. As mentioned above, the nanotubes ﬁlms are typically grown on Si substrate. Although many optical components including mirrors, slits and small blocking elements such as coronographic masks could be feasibly made out of Si, the use of this substrate alone will limit the usability of the nanotube coatings in situations where it is required to use more robust substrates. We investigated and developed a growth process that yielded similar performance as samples grown on Si. 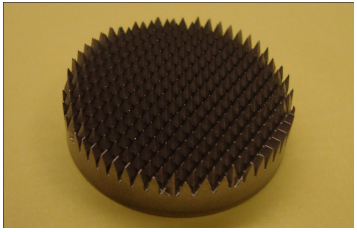 The substrates investigated included stainless steel, nickel and titanium using the same thickness of iron catalyst layer and growth parameters optimized on the Si substrates. Titanium substrates produced low THR when the adhesion layer thickness was increased. Successful growth using the optimized process was also achieved on stainless steel. We are also exploring nanotube growth on silicon nitride (SiN) membranes for infrared detector absorber structure applications. Figure 5. Room-temperature THR for MWCNT grown on a variety of substrates. Figure 5 shows THR data for several nanotube samples grown on diﬀerent substrates. The sample with the highest THR values in the short wavelength range (below 2 μm) is the one labeled “1mm long”. This is a sample that was grown at Southern Illinois University (by Saikat Talapatra) that was initially determined to have relatively high THR in the UV-NIR. However, measurements in the mid-infrared show that the MWCNT on this sample are a much better absorber in this region. The silicon, SiN, and Ti substrate samples all have nanotube lengths of 50 to 100 μm. Hence, the results in Fig. 5 show that they all perform better in the UV to near-infrared but are similar to the “1mm long” sample at longer wavelengths. This is probably due to the diﬀerence in the eﬀective index of refraction of the samples as a function of wavelength. The initial interaction of light with the nanotube mat results in reﬂection based on the “eﬀective” index change between air (or vacuum) and the nanotubes. Since carbon has a relatively high index, we want a very low density of nanotubes so that the boundary does not produce a large reﬂection. Bulk carbon is black but very shiny due to its high index. The nanotube mat has about a 1% ﬁll factor making the eﬀective index approach 1 to prevent a high impedance mismatch. The density of the “1mm long” sample is higher, therefore it reﬂects more light at short wavelengths. At longer wavelengths, the index changes similarly for all samples, but the penetration of the light into the nanotube mat begins to dominate, with a higher eﬃciency of absorption for the taller mats. Therefore, best performance requires an optimization of density and height to provide best broad band absorption. Finally, we show two samples grown on Si with the growth parameter “t” being the time of hydrogen pre-treat before growth set at “t=0” and “t=+5” where the numbers are in units of minutes. The “t=0” sample grown on Si has the lowest average THR of all the samples in the spectral range shown in Fig. 5. We now turn our attention to THR data obtained with the OPASI-T reﬂectometer on three selected samples from the set shown in Fig 5. Figure 6. Reﬂectance ratios of the black calibrator (dotted black) and a MWCNT sample (solid red) grown on Ti relative to the highly reﬂecting (? ?100%) reference sample. Note: The dashed blue line corresponds to the ratio of two consecutive 100% reference sample spectra to demonstrate the system stability. sample provide the “100% baseline” calibration that will be needed later for correcting and normalizing the test sample response. A second position on the wheel is occupied by a “black” calibrator and it is used to calibrate out the “0% baseline” response. The sample under study is placed on the third and ﬁnal position on the wheel. Because of the limited nanotube sample size, we placed an aperture (made out of reﬂecting Al tape) to mask the oversized beam hitting the test port on the sphere. Since this mask was common to all three ﬁlter wheel positions, the oversized beam provided a relatively high background signal reading that needed to be removed from the sample results. The procedure below discusses how this normalization was carried out. The experiment was started by ﬁrst performing a cool-down of the reﬂectometer dewar with liquid Helium (LHe) in order to cool the bolometer detector to its operating temperature at 4.2 K. The temperature for the whole system was monitored until it reached thermal equilibrium. This was done by checking and collecting a series of scans of the FTS interferometer signal on the reﬂecting or “100% baseline” sample mentioned above. The system was deemed stable after several consecutive ratios of this signal yield a nearly 100% constant line as shown by the curve labeled “100% baseline” in Fig. 6. Once the system had reached thermal equilibrium, a series of 100% reference scans were collected and averaged. After this, the ﬁlter wheel was rotated to the position of the black calibrator, an image of which is shown in Fig. 7.
size of the MWCNT’s used for these tests. This leads us to the third curve in Fig. 6 labeled “MWCNT on Ti(t=0)”. These are data corresponding to the ratio calculated by dividing the reﬂected light from the sample by that of the 100% reference sample. We ﬁnd the average value is around 64%, which is about 2% higher than that of the black calibrator sample. Figure 7. Image of aluminum substrate disk with a regularly texture surface. This device is used as a “black” standard to provide a 0% baseline spectral calibration. Note the device is shown before the 56 µm of Acktar Fractal black coating is applied. Once coated, the structure details of this standard are diﬃcult to see. Figure 8. 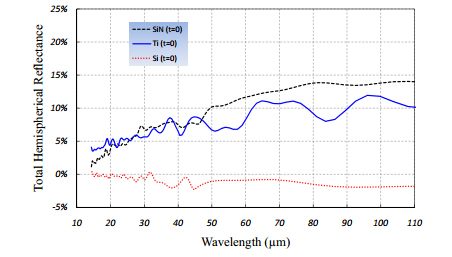 Total Hemispherical Reﬂectance for three MWCNT samples grown on Si, SiN, and Ti substrates. The results of applying the calculations of Eq. 9 to the data in Fig. 6, along with results of MWCNT grown on Si and SiN substrates are shown in Fig. 8. The THR values for all the samples start oﬀ in agreement with the λ 20μm data shown in Fig. 5. However, the data for the MWCNT grown on SiN and Ti samples show a positive (almost linear) increase towards longer wavelengths, reaching values close to 14% and 10% respectively at the long-end of the wavelength range shown. These results suggest that the these coatings are becoming less eﬀective in absorbing electromagnetic radiation at longer wavelengths. This is in contrast with the results obtained with the MWCNT sample grown on Si substrate where the THR values remain constant near the zero mark in Fig. 8. In other words, we found nearly identical response from the either the MWCNT sample grown on Si or the black calibrator standard. The slightly negative results shown in Fig. 8 for the Si sample are well within the margin of error and they result from directly applying Eq. 9 to the ratios taken with the MWCNT sample and the black calibrator. to either the SiN or Ti substrates as discussed in Sec. 3. Figure 9. Temperature-dependent emittance obtained from equations presented in Sec. 2.2 for various black optical coatings. We now turn our attention to calculating emittance versus temperature using the equations presented in Sec. 2.2. We performed these calculations for the three samples shown in Fig. 8. We also compare these results with other more traditional black coatings. The results are shown in Fig. 9. The integral in Eq. 4 implies that the THR data would be needed over an inﬁnite wavelength range; but in practice, it is suﬃcient that the upper wavelength limit for the THR data contains 95% or more of the Planck’s radiator energy. Another important consideration is that the measured THR does not have a strong dependence on temperature. We have validated this assumption in the present case since we found the THR data at ambient (300 K) temperature merge smoothly without any discontinuity in the range they overlap with the far-infrared data taken at 7 K on the same sample. The results of this analysis yields an integrated emittance that is the highest for the MWCNT grown on Si (t=0) substrate. The average value of ε(T ) stays around 97-98% over the 50 to 300 K temperature range shown in Fig. 9. 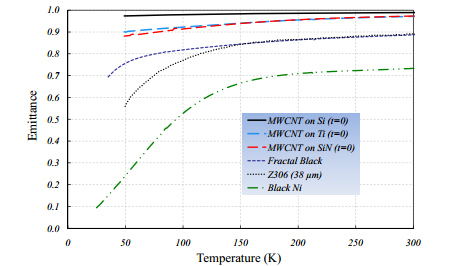 The MWCNT coatings grown on Ti and SiN display the second and third best emittance values as a function of temperature (average values over 95% for both samples). These averages compare favorably with the current state-of-the-art that are typically measured on Fractal black and other more commonly used black paints such as Z306. In conclusion, we have performed total hemispherical reﬂectance (THR) measurements on MWCNT samples grown on various substrates in the visible mid- and far-infrared wavelengths. 110 μm. Explanation for the superior performance of the Si-based sample could be due to two possibilities. First of all, if these results are explained in terms of a partially transmissive Si substrate at infrared wavelengths, the higher absorption could be due to a double-pass of the light through the nanotubes coatings. This is due to the fact that the sample was mounted on an opaque Al disk that would have reﬂected back any light that had initially made it through the nanotubes and the substrate. Secondly, if nanotubes grown on Si made the sample completely opaque to infrared radiation, the high absorption would imply the nanotubes may be longer and better aligned in comparison to samples grown on either SiN or Ti substrates. Although we believe this to be the most likely explanation, further studies would be required to ﬁnally settle this issue. But regardless of the substrate on which they are grown, the THR data measured on any of the MWCNT samples lead to emittance values that are higher across a temperature range from room temperature down to about 40 K, when compared to other more traditional black coatings such as Acktar Fractal Black or Z306. This work is supported through a NASA-Goddard Space Flight Center (GSFC) Internal Research and Devel- opment (IRAD) grant (J.G. Hagopian, PI). One of us, Raymond (Robin) E. Kinzer Jr., is supported by an appointment to the NASA Postdoctoral Program at GSFC administered by the Oak Ridge Associated Univer- sities under contract with NASA. John G. Hagopian, Stephanie A. Getty, Manuel Quijada, June Tveekrem, Ron Shiri, Patrick Roman, James Butler, Georgi Georgiev, Jeﬀ Livas, Cleophus Hunt, Alejandro Maldonado, “Multiwalled carbon nanotubes for stray light suppression in space ﬂight instruments,” Proc. SPIE 7761, 77610F (2010). Nicodemus, F. E., Richmond, J. C., Hsia, J. J., Ginsberg, I. W., and Limperis T., [Geometrical considera- tions and nomenclature for reflectance ], National Bureau of Standards Monograph 160, US Department of Commerce, Washington (1977). Stephen A. Rinehart, Dominic J. Benford,1 Giuseppe Cataldo, Eliahu Dwek, Ross Henry, Raymond E.Kinzer, Jr., Joseph Nuth III, Robert Silverberg, Caleb Wheeler, and Edward Wollack, “Measuring the optical properties of astrophysical dust analogues: instrumentation and methods,” Applied Optics 50, 4115–4124 (2011). Zu-Po Yang, Lijie Ci, James A. Bur, Shawn-Yu Lin, and Pulickel M. Ajayan, “Experimental observation of an extremely dark material made by a low-density nanotube array,” Nanoletters 8, 446–451 (2007). E.J. Wollack, D.J. Fixsen, A. Kogut, M. Limon, P. Mirel, J. Singal, “Radiometric waveguide calibrators,”IEEE Transactions on Instrumentation and Measurement 56, 2073–2078 (2007). D.J. Fixsen, E.J. Wollack, A. Kogut, M. Limon, P. Mirel, J. Singal, J., “Compact radiometric microwave calibrator,” Review of Scientific Instruments 77, 64905–1–6 (2006).